I’m not writing much this week or next because I’m busy hiking – well, not as of the writing, but as of the posting. 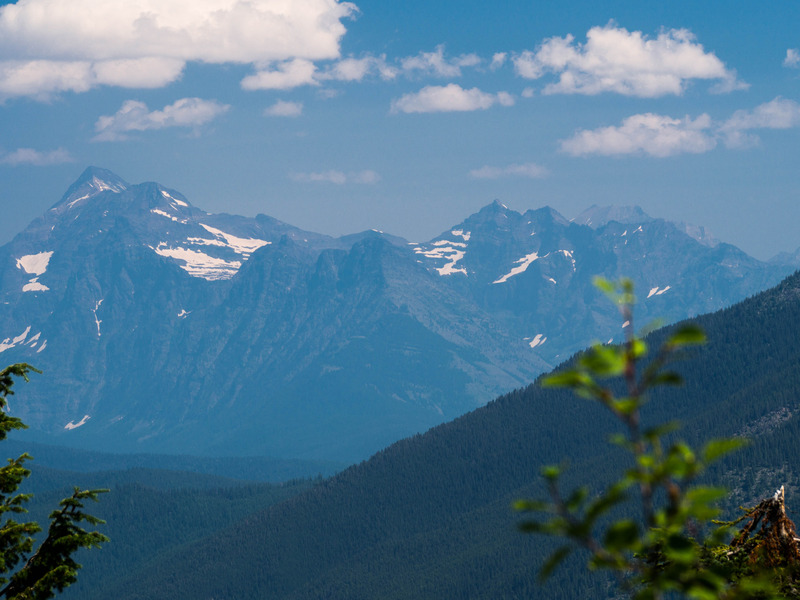 So this is actually a look back at a hike from last summer, Apgar Lookout in Glacier National Park. As hikes go, it was one of the less rewarding ones we did in the park. As days go, it was one of my favorites. 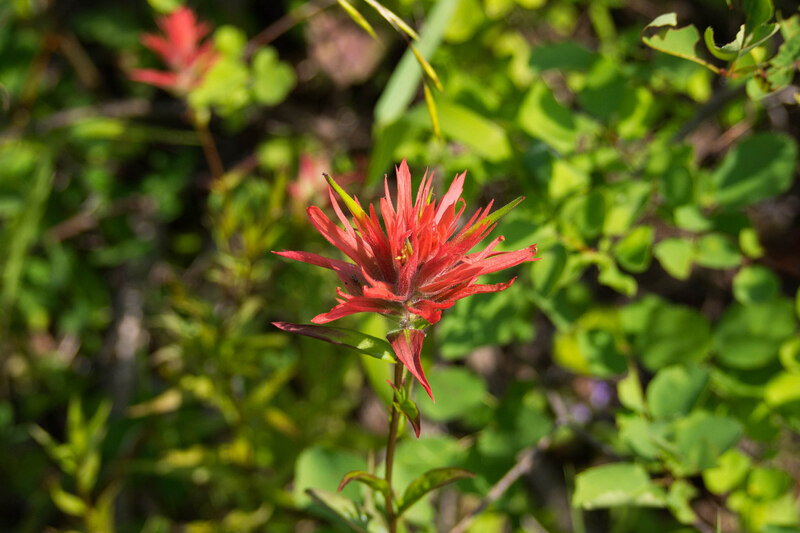 Flowers along the Apgar Lookout trail. The day was a scorcher and we got a bit of a late start. 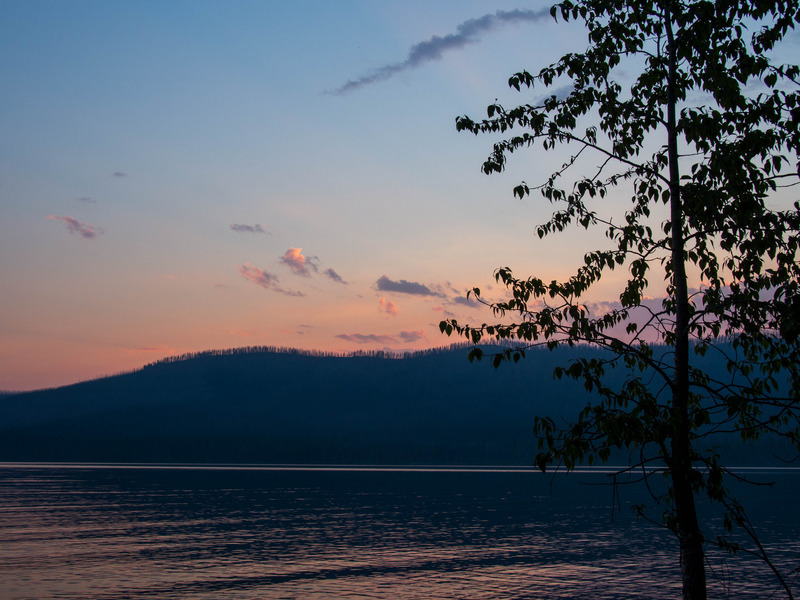 I always say I’m going to get up early and get going – definitely wishful thinking on my part. So as we set out, it was hot, bright, and sunny, although also a bit hazy and smoky from forest fires in nearby states and provinces. 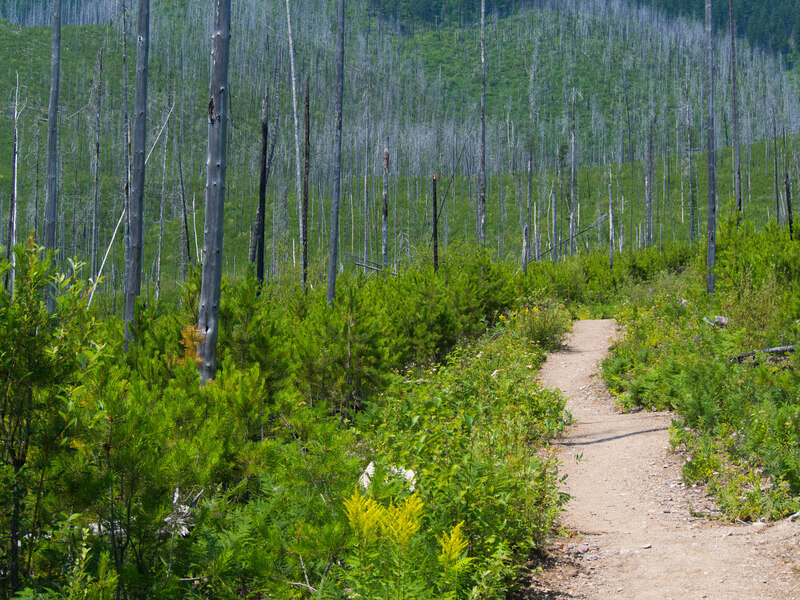 The Apgar Lookout trail is on the west side of the park, and is just over 7 miles round trip. But those are some steep 7 miles, for sure. Before beginning, we had driven to what we thought was the trail head at a horse corral. We were all ready to go when we encountered a very tanned and in-shape man with white hair who wore a gold cross on a chain and swung a bright yellow shirt as he walked around. And thus, luckily, we discovered that we were not yet at the trail head after all. I consulted our guide book, and learned that we needed to drive down a pot-holed road, over a bridge, and to the “terminus of the road.” We chatted with the man for a few minutes, and then he said he’d follow us. So we drove the gravel road, dodging pot holes as well as we could, crossed the bridge, passed a woman and two children picking berries, and arrived at the terminus of the road. Thank goodness we ran into them, or else we would have unnecessarily added several miles to our full trip. Of course, we might have realized on our own, but it wasn’t really looking that way. Burnt-out section of the trail. At the trail head, we chatted with both John, of the yellow shirt, and his wife, Lynn (names we learned much later, as seems to be common in casual travel encounters). Then we set out a bit ahead of them. The trail begins by traveling briefly through a wooded area. It crosses a tiny creek, and then for pretty much the rest of the approximately 3.6 miles you are in the open – the result of a 2003 fire. 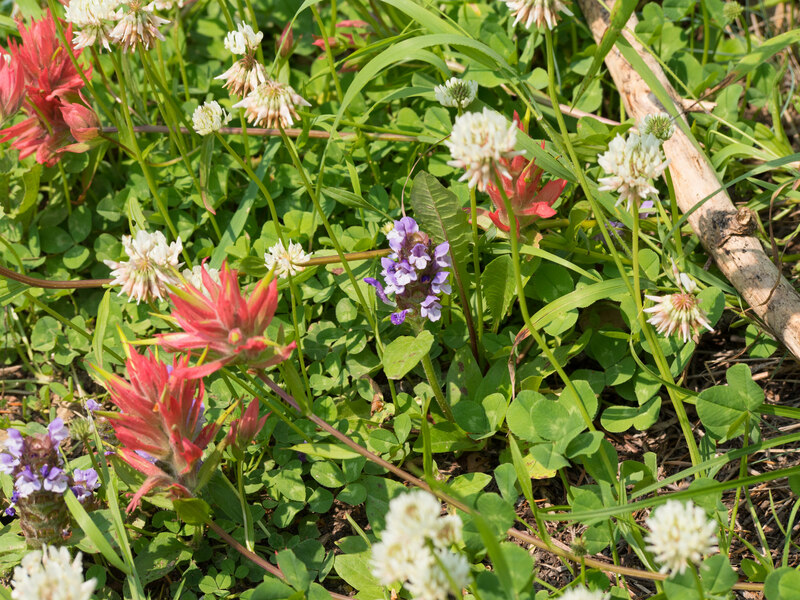 During this part of the trail, on the way up, I was caught up in watching the butterflies all around us. Little butterfly families sitting on the rocks (well, they were probably standing), butterflies flitting all about. 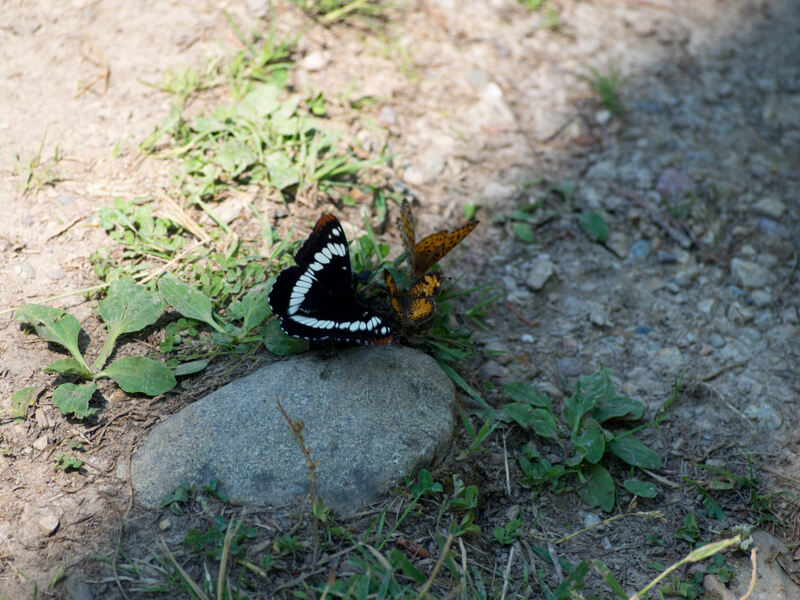 Butterflies along the Apgar Lookout trail. We hiked at too good a clip, which hit me hard in the heat, and I felt a little sick as we neared the lookout. Actually, I felt sick before that. I was clearly not in vacation-hiking mode yet, and still in hiking-for-a-good-workout mode, and I shouldn’t have been, not in that heat, not with so many switchbacks. I started getting chills, my head and arms were tingly, and my stomach felt sick. So we slowed down and took it really slow, and I stopped several times, or whenever there was even a hint of shade. When we got to the top, I realized, looking at a map, is that there are so many mountains that most of what I saw didn’t even have a name. The visibility was greatly limited for far peaks because of the smoky haze. Apparently when it’s clear you can see quite far. Alas. A too-hot hike and limited views. Still, this was a great day because of the people. I don’t know whether it’s just my disposition when I’m out on a trail, or whether it’s the other people, or maybe both, but everyone seems generally happy on trails. Hikers greet one another, often with a smile, and often with a word or two about the day, about the trail. When we arrived, there were three other people at the lookout: an older woman, a young boy, and a man. (Check out a live view from the lookout here.) The man gave the woman some of his water because she’d run out, and then he headed back down the trail. The four of us who remained set up on the lookout “balcony” to eat our lunches and rehydrate. Then two other woman, who were with the pair already there, arrived and we all chatted. They were locals and had a Tuesday/Thursday hiking club. John and Lynn arrived, and Lynn joined us for the sitting-in-the-shade party, which Chris left to photograph a grouse. He ended up chatting with John, and the two of them eventually made their way up to the lookout balcony as the other party of four left. I chatted with Lynn, and found they couple was from NY, where she also works at a school, while John is retired. They were on a multi-week RV trip. In Seattle, they’d met up with an old school friend of John who John had contacted but hadn’t been in touch with previously – only heard he lived there. It turned out once they met that the guy didn’t remember John and had been expecting someone else, but they all hung out and had a good time anyway. 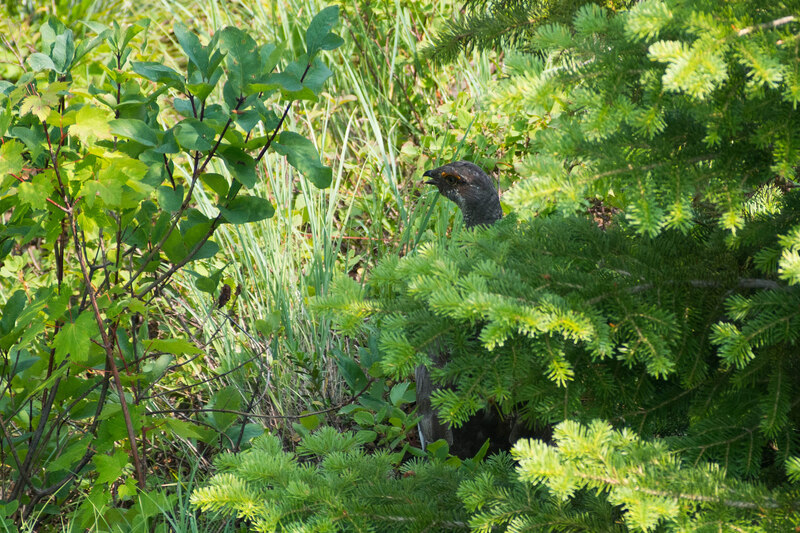 A grouse at Apgar Lookout. We talked shop (school district comparisons and such), talked about their travels, and talked about West Virginia, where they were thinking of moving there (provided it was rural enough – ha!). Eventually we all decided to get a move on, and we took pictures of each other for each other, and headed down – which was much easier and quicker than up, thank goodness. We met up with John and Lynn again in the parking lot and exchanged a few parting words. The door on the side of their rental RV had an image of two kids’ faces looking out of it. “The kids are always so happy to see us,” Dell quipped. Chris remarked that they were probably getting kind of hot in there. It was a good day, one that we ended by floating on tubes in Lake McDonald, with mountain views as refreshing as the cold water. We came by those tubes when we at breakfast at Lake McDonald Lodge the day before and sat with two Virginians who were in the area after having run a marathon. Someone had given them those tubes, and they gave them to us, and a few days later we passed them on again. In my everyday life, I’m often trying to get time away from people. Working at a high school, I spend every day working with and talking to people. I definitely need time to wind down from that. But on the trail, it’s a delight to interact with the others out there. Doing so can make even an “eh” hike into a great day.